This webpage details our ‘Grow Food Everywhere’ program evolution. We have created over 50 raised bed gardens in a variety of settings that engage community members of all ages in growing and enjoying fresh food freely. Over the years, these have been created at schools, health care facilities, childcare centers, public libraries, and more recently women’s centers, jails, and a recovery center. Currently, our Grow Food Everywhere program for family childcare providers helps nourish young children and their families. Through a partnership with the Franklin County House of Corrections, we teach gardening for incarcerated men, and will provide workshops for families of pre-release inmates as well. We are also pleased to partner with Greenfield Community College, Montague Catholic Social Ministries, and New England Center for Women in Transition and the Women’s Fund of W.Mass on the GARDEN project that supports food and economic resilience for low-income women and those who have experienced trauma. Additionally, a new partnership with Heywood Hospital and their Quabbin Retreat center for those in recovery from substance abuse engages us in creating therapeutic gardens and related programming at their site in Petersham MA. We are happy to share our Grow Food Everywhere Care Guide with ideas to support your 3 season and abundant gardening efforts. Get our free guide to Creating Raised Bed Gardens. Read our article in the 2014 issue of the American Community Garden Association journal on Food Justice. Enjoy this Research Report with findings from our childcare provider garden program. Check out our google map and key to see locations of 30 (and counting) Grow Food Everywhere gardens implemented in the region- plus another 20 for low income families! 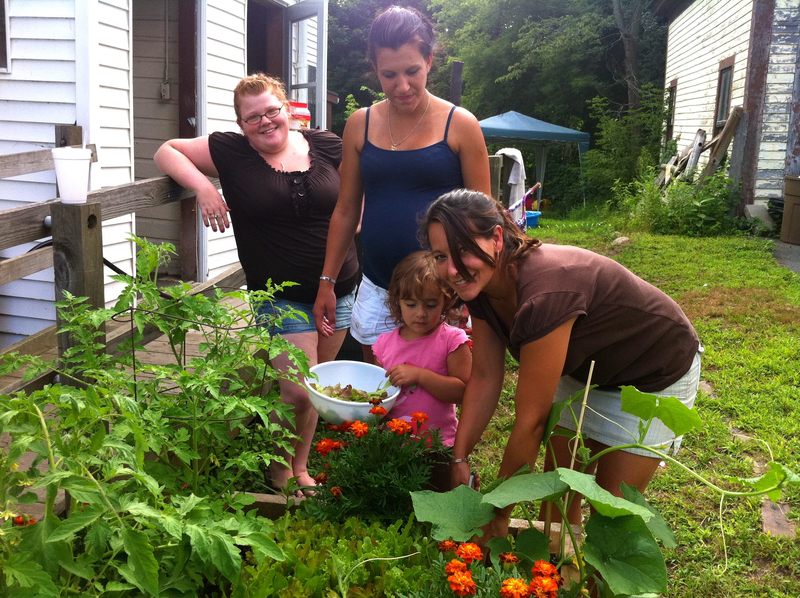 Program History: First there were gardens for 7 schools (2003-2006 implementation) then at the Athol Memorial Hospital, then community food resiliency came to exciting fruition in 2011 with the launch of our Grow Food Everywhere for Health and Justice initiative. Our community suffers from hunger, childhood obesity and economic despair. 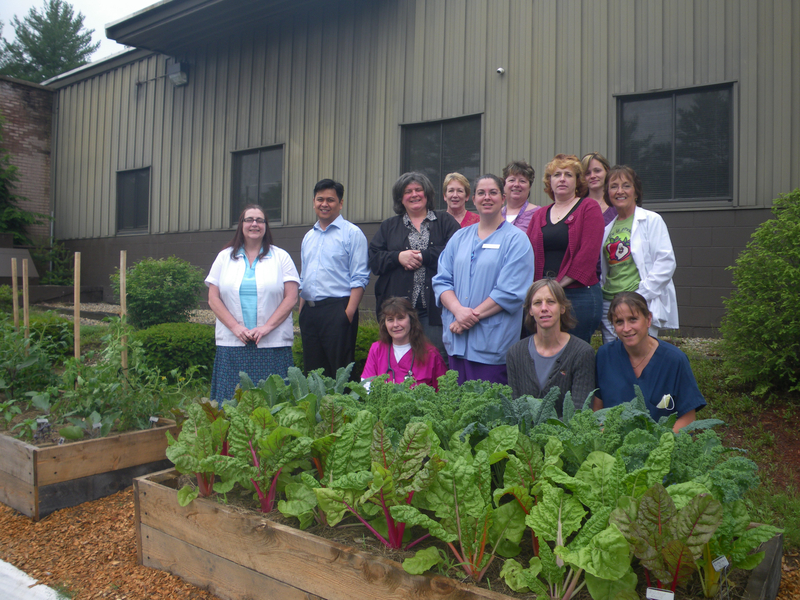 In uplifting response and towards wellness for all, we created raised bed gardens that provide nutrition education and real food for anyone in need at our local community health center. In 2012 we added gardens at the Orange Innovation Center, a converted factory, cared for by tenants and master gardener Pat Conrad who brings food to the Orange Food Pantry. In addition, by the end of 2012, twenty low-income families received raised beds abundant with salad greens, tomatoes, cukes and beans. Fresh food for all, one household at a time. Then we created gardens at the local public library, the North Quabbin Community Co-op, and the Orange Food Pantry. A garden creation begins with the arrival of community resources: locally milled lumber, a truck filled with rich soil from Clearview Compost, and a crew of enthusiastic Seeds of Solidarity staff and sometimes volunteers. Seeds of Solidarity staff and youth leaders visit through the season. Grow Food Everywhere beds can include a “mini-hoophouse” to extend abundant crops and much-needed nourishment of their family well into the winter, and enable an early start to fresh salads come spring. History:Through our Grow Food Everywhere for Health and Justice initiative we initially created gardens at the homes of families facing hunger as well as throughout the community. But joblessness, landlord problems or domestic violence sometimes meant they had to leave their homes… and gardens. Simultaneously, we realized that there were many women in our community who ran family childcare programs at their homes, and that these providers could reach 10-12 children and their families-many in need of nourishment in all forms- through one garden. And, they had the enthusiasm and flexibility to integrate garden learning into the day, and to use their fresh harvest for snacks and lunches. Over the past two years, this program has blossomed a supportive and enthusiastic network of family childcare providers, inspired many young children to grow, prepare and enjoy healthy vegetables, increase physical activity, cultivate connection to nature, and extend fresh joy to their families.